Every two years we host a conference in St. Cloud to bring people together from across Minnesota. Explore past events below. Save the date for the 2020 event! Save the date for the CERTs 2020 Conference Monday, February 10th and Tuesday, February 11th, 2020! Stay tuned for the agenda and more information! 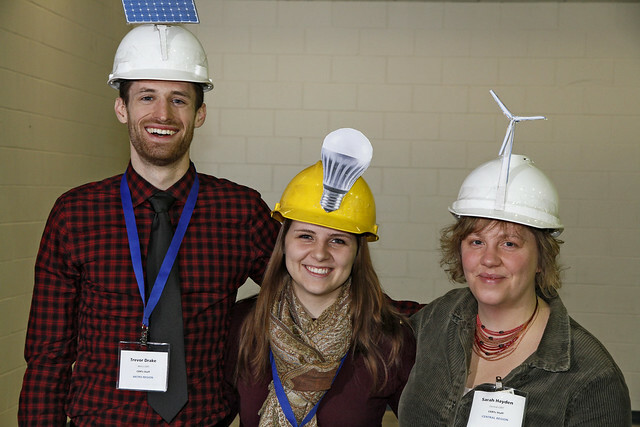 Over 500 Minnesotans attended the seventh statewide CERTs Conference, connecting to build a clean energy future in their communities! March 28-29 were two truly energizing days in St. Cloud, MN for the 2018 CERTs Conference. Communities, organizations, and individuals showed up to figure out how they can get projects done, save money, and be part of Minnesota’s fastest growing jobs sector. Community Solar Gardens: What’s New, What’s Next? 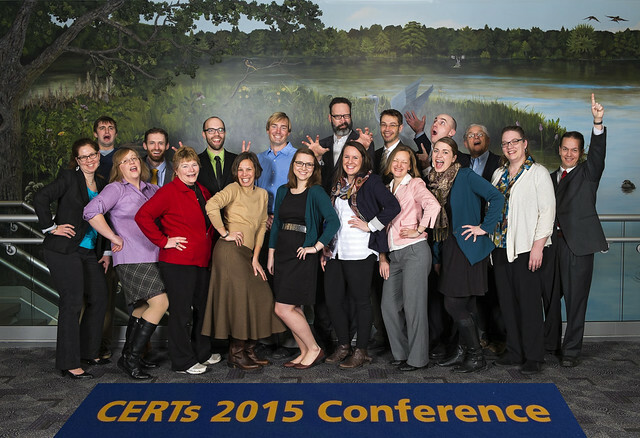 Over 500 people attended the CERTs 2015 Conference! The event was an exploration and celebration of successful energy efficiency and renewable energy projects. Now these amazing people have returned to their communities with the resources and connections they need to take action—how great is that? Dan Juhl, Juhl Energy, Inc. This session provided an update on the Made-in-Minnesota (MiM) solar rebate, an overview of utility solar incentives, an introduction to the Minnesota Solar Suitability App, and tools for decreasing solar soft costs. This session introduced attendees to the basics of energy-saving LED street lighting. We learned from local governments and utilities alike who have installed LED street lighting. They included technologies, costs, financing, lessons learned, and more! Utilities serving farms across Minnesota gave an overview of their programs, from energy audits and rebates for efficient equipment to tailored technical assistance and beyond. Community members can be a vital source of financial support for clean energy projects. This session provided an overview of crowd funding approaches, with case studies from Bonnie’s Grocery in the West Central region, El Norteño Restaurant in the Metro, and Rural Renewable Energy Alliance in Central Minnesota. Lunch was time for attendees to connect with people from across the state working to build a clean energy future. Electric vehicles are hitting the streets of Minnesota. During this session people learned about current vehicle technology, existing efforts to expand the state’s network of EV charging stations, and utility efforts on EVs. Have you ever been exasperated by how difficult it can be to motivate people to change behaviors for energy conservation? Prompting behavioral change is not easy! Fortunately, social scientists took the guesswork out of how to influence people to change their habits. This session provided an overview of behavior change strategies, a few community-based project examples, and an opportunity to reflect on and integrate behavior change science into energy work. Heating with solar energy offers excellent opportunities in Minnesota. This session provided an overview of various technologies and applications; costs, benefits, and limitations; and efforts to promote solar thermal strategically across the state. Paying for it is often the hardest part of any project, solar energy included. This session provided an overview of challenges and opportunities with conventional private financing, loans, and crowdfunding approaches. We then heard from speakers who dug into innovative loan models, solar endowments, and third-party financing. This session provided an introduction to community solar gardens in Minnesota. We reviewed basic concepts and then heard about existing projects and how they work, including projects from cooperatives and in Xcel Energy territory. We ended with tips about questions potential subscribers should ask. Are you curious about biomass projects that communities and businesses are using to reduce costs and expand their clean energy options? This session provided an overview of biomass technologies in use in Minnesota, project models, and tools for funding and implementation. This session offered an opportunity to hear about and discuss the range of LED lighting technologies for farming, including technologies/applications under study, new products on the market, and tried and true applications that are being combined with delivery approaches for greater adoption. This session offered an overview of new financing energy efficiency and clean energy opportunities for cities, counties, schools, and businesses in Minnesota through the Guaranteed Energy Savings Program (GESP) and commercial Property-Assessed Clean Energy (PACE). We also dug into program and project eligibility, with time for questions. During these sessions, people identified top project ideas and themes from each region of Minnesota, and helped people with project ideas find the resources they need to move forward. Project ideas from these sessions will help CERTs Regional Steering Committees plan out the next year of meetings, prep for the 2015-2016 Seed Grant Round, and determine how to align CERTs staff resources to address the region’s most pressing clean energy needs. $5 Million and Change for Duluth! Charge, Drive, Have Fun. Repeat. These presentations sparked great conversation throughout the evening, accompanied by drinks, dinner-worthy appetizers, and live folk music by the Moonlight Duo of Nick Jordan and Mary DuShane. Minnesota GreenStep Cities is a voluntary challenge, assistance and recognition program to help cities achieve their sustainability and quality-of-life goals. This free continuous improvement program, managed by a public-private partnership, is based upon 28 best practices. Many of these best practices are focused on ways that cities can save energy through conservation and efficiency measures, and also produce renewable energy. In this workshop we dove into these best practices, and heard from member cities who have already done the work in their own operations and communities. The workshop also included an award ceremony hosted by the Weidt Group for those cities who have been most successful in saving energy as tracked in the B3 Benchmarking database. 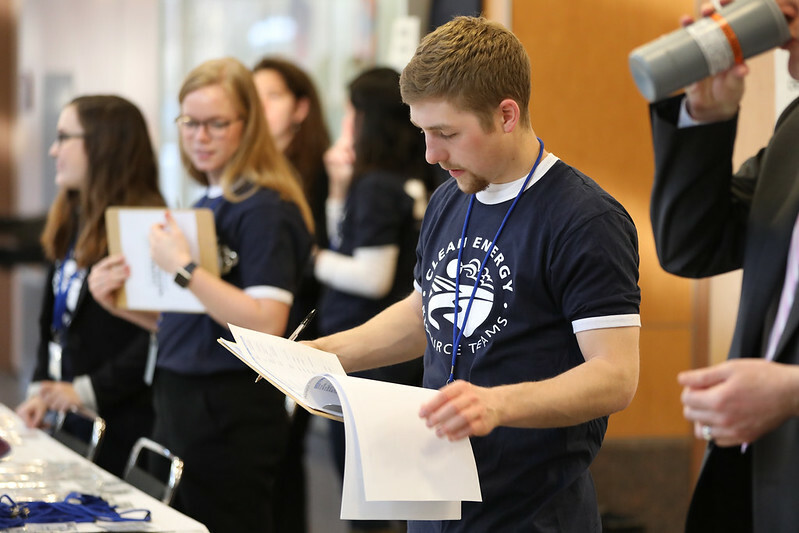 This interactive workshop featured poster presentations from more than a dozen energy professionals about their efficiency research in an array of sectors in Minnesota. All of the presenters received Conservation Applied Research & Development (CARD) grants from the Minnesota Department of Commerce. They provided overviews of their research and work to the full group, and then made themselves available for one-on-one conversations with attendees. The Rural Energy for America Program (REAP) from USDA Rural Development is a great opportunity for Minnesota farmers and rural businesses to save energy with efficiency work and add renewable energy systems. Grants can cover up to 25% of eligible project costs, and loans can cover up to 75% of eligible project costs. This workshop reviewed changes to the program and offered assistance with preparing applications. The workshop was designed for potential applicants, those assisting potential applicants, and any parties interested in energy efficiency and renewable energy projects. WoodMaster & Northwest Manufacturing, Inc.
CERTs 2013 was an exploration and celebration of successful energy efficiency and renewable energy projects, and a coming together of hundreds of amazing people who are working to create a clean energy future in their communities and beyond. 3:00-3:30PM This workshop will highlight case studies from utilities and their partners across Minnesota to see what effective energy savings programs might be replicable across service territories. Programs include specific sector targeting, behavior change opportunities, scalable technology-focused projects, and smart measures, among others. Is your local government looking for rules of thumb for energy efficiency or wondering if renewable energy is the right fit for you? This workshop will emphasize the sorts of energy-saving projects that local units of government should do now, and focus on why certain technologies are a good fit for certain uses. Join solar professionals, Minnesotans with installed projects, and peers to talk about real, concrete steps toward moving your solar project forward. There will be opportunities to discuss your project with a variety of solar professionals. To prepare, feel free to come with your virtual solar site assessment and photos of your site. Learn about emerging technologies, including electric vehicles and new building technologies (such as smart meters, phone apps, and remote control), and projects that are incorporating these technologies. 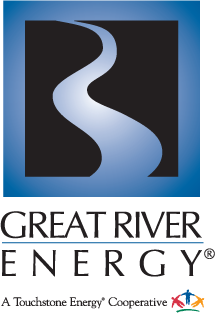 Learn about the best applications for geothermal and air-source heat pumps, as well as innovative uses of these technologies in projects throughout Minnesota. Come learn the latest information about the wind industry in Minnesota, from large-scale commercial development to single turbine projects at farms and schools. Learn about community biomass projects throughout Minnesota, how you can do your own, and what technologies and resources are available. Learn about interesting solar community-ownership and bulk-purchase programs, emerging financing models, differences in markets by technology, opportunities and challenges, and resources to bring back to your community. Join this interactive session to discuss and learn how your business can analyze return on investment (ROI), meet project partners, discover resources and tools, and reap the rewards of energy efficiency. This session highlights recent initiatives in developing farm energy efficiency as a price-competitive energy resource. Come learn about farm energy audits, how an audit will help identify proper energy efficiency improvements on the farm, and super-efficient LED light technology that can boost farm profitability. Learn about innovative projects happening in schools across Minnesota and how they have involved students and the community in benchmarking, energy efficiency, and more. You have heard about all of the ways you can reduce your energy use and save money, and now it’s time to act. Learn how to get past key obstacles on your journey toward energy efficiency! B3, GESP, and PACE. What do these acronyms have to do with me? Come learn how these tools and programs can help you foster energy efficiency in your local government operations and in your community! Join attendees from your CERT Region to identify five energy efficiency or renewable energy projects in (35 projects statewide) that can be implemented by the next CERTs Conference in February 2015. Whether you have an idea to share or are eager to work with others, there’s a role for everyone! Learn more about the Regional Sessions. Juhl Renewable Energy Systems, Inc. The CERTs 2011 Clean Energy Convergence united Minnesotans who are blazing the paths to a clean energy future by working on energy efficiency and renewable energy projects in their communities. 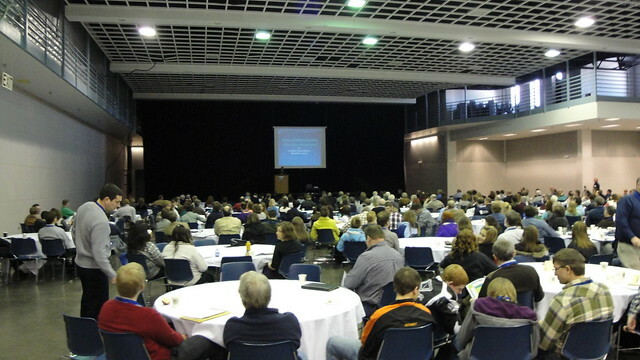 The event brought together over 600 engaged community members on February 2-3, 2011 in Saint Cloud, MN! This workshop covered four interesting case studies from utilities and their partners in Minnesota that range from behavior change pilots to outcome-based incentives, and featured moderated dialogue about ideas and strategies to meet CIP goals in the years ahead. Carl Nelson, Center for Energy & Environment; Mike Hoy, Dakota Electric (Presentation >>); Todd Berreman, CenterPoint Energy (Presentation >>); Diana McKeown, Metro CERT – Discuss various aspects of their programs, including the use of motivational community meetings to drive participation, leveraging neighborhood groups, direct install measures in conjunction with audits, and using audits to drive customers toward other utility programs for more expensive improvements. Have you been wondering how to jump-start action in your community on clean energy and energy efficiency? Look no further! This workshop presented strategies from leaders in workplace, university, business, and civic perspectives who have been building capacity in their communities. These case studies offer a real sense for what is working in other communities and introduce you to people you can talk to as you work to move your community to take action. This workshop provided practical information to help attendees identify energy-saving opportunities, connected people to financial incentives to help pay for energy efficiency improvements, and give them the tools needed to conduct long-term energy planning and benchmarking. A panel of business leaders discussed their energy-saving initiatives and processes, project challenges, and the savings they’ve achieved. Jill Curran, Energy Smart – Making the Financial Case and Finding the Money: Will highlight types of incentives that may be available including utility rebates, federal tax credits, local government grants and how organizations can best be prepared to pursue them; Will also make the case for why saving energy boosts the bottom line and will highlight some return on investment information for various types of upgrades. Chelsey Johnson, Energy Smart – Generating and Tracking Long-term Success: Will discuss the value and process by which organizations can track and analyze their energy consumption; Will discuss reading and interpreting energy bills, putting together a utility bill analysis and how this data can be used to benchmark energy-savings potential; A utility bill analysis and Energy Star building rating how-to demonstration will be conducted. Kelly Spors, Energy Smart – Moderating a Business Leaders Panel: Leaders that have taken on ambitious energy-saving initiatives will discuss their initiatives, the savings they’ve achieved, their project challenges, and how they overcame them. Saving energy and producing clean energy at your school is an exciting and challenging endeavor! This workshop began by discussing top-down approaches to creating a clean energy school, like understanding building energy use, the importance of benchmarking, and good projects to take on. It then takes a close look at how one school, Aitkin High School, is working from the bottom up as we hear from teachers, administration, and students alike about their efforts. The workshop finishes by meeting in the middle to talk about how to pull together a dream green team that can work on your clean energy school! Moderator Patrick Santelli, Minnesota Schools Cutting Carbon – Introduction: Will discuss top-down and bottom-up approaches to creating clean energy schools. The goal of this workshop was to help cities understand the mechanics of the GreenStep Cities Program, hear stories and examples from cities who are already participating, and learn about other ways to engage your community and its many resources to help your city achieve its goals. Panel Discussion: Findings and Perspectives from Cities on integrating GreenStep with existing efforts, up-front work to get your City to sign a resolution, and the mechanics of “reporting in” on your achievements. The Third Clean Energy Resource Teams Conference was held in St. Cloud on February 10-11, 2009 at the St. Cloud Civic Center. CERTs 2009: Harnessing Resources & Teamwork for Minnesota’s Energy Future brought together 500 Minnesotans who are blazing the paths to a clean energy future by working on energy efficiency and clean energy projects in their communities, thus accelerating our learning process together. This conference could not have come at a more important time. Our economy is hurting, energy prices are on the rise, and the impacts of global warming are becoming increasingly clear. Minnesotans of all stripes want to know what they can do. It just so happens that many of the solutions to our global climate challenge are also the ones that are going to help our economy and our communities thrive. CERTs 2009 told participants, “You can be a part of Minnesota’s clean energy future, and you can get energy efficiency and clean energy projects on the ground in your community!” It’s true: Whether you’re a farmer, utility representative, school staff, local official, student, business owner—or member of any community—there is a role for you to play. Conference attendees learned what people are doing across the state, connected, and shared resources. Community-Based Energy Development: This session introduced attendees to clean energy development, especially with regard to wind power. They learned how to put together a community wind project, what variables impact return on investment, and how Minnesota is supporting community-based energy development. They also heard from a panel of wind energy experts about business models for wind development. Accelerating Residential Efficiency: The residential sector is one of the largest energy consumers in Minnesota, and therefore holds great potential for energy efficiency. Attendees found out how utilities, non-profits, and community groups are working to accelerate programs and learning to help residents conserve. Saving Energy is Smart Business: Attendees learned how their business can save money by taking advantage of existing Conservation Improvement Programs (CIP) offered by Minnesota’s energy utilities. Business executives also shared their stories of implementing energy efficiency upgrades, receiving rebates through the CIP process and realizing substantial dollar savings on monthly electric bills. Creating a Clean Energy School: There are schools across the state, at all levels, that are working to save energy and produce clean energy, issues that are especially important with our current climate challenge and fuel costs. This workshop featured schools who are working on innovative projects, with major results. We found out what administrators, operators, teachers, and students can do to be a part of the action. Best Practices for Local Governments: Local government leaders at the city and county level will shared step-by-step the trailblazing initiatives that they are undertaking to determine their clean energy future, leading us toward a discussion of best practices for local governments working on clean energy. Dan Juhl – Chairman and CEO, Juhl Wind, Inc.
Mike Greenbaum – Finance and Development Director, Merrick, Inc.
Moderator: Trudy Richter – President, Richardson, Richter & Associates, Inc. The conference was a huge success. Over 400 people came together on both days. Participants represented people from all walks of life – local governments, schools, universities, business people, farmers and farm group members, members of environmental groups, retirees, and more. Highlights included keynote speakers Alexis Karolides from Rocky Mountain Institute and WCCO’s Don Shelby, 15 different breakout sessions, and a legislative forum hosted by MPR’s Kerri Miller. Participants gave high marks to the conference overall and to each of the speakers and breakout sessions. The January 2007 CERTs Conference, Local Energy/Local Opportunities, featured many knowledgeable speakers who discussed topics from biodiesel to community wind development to green buildings. To view pdfs of the PowerPoint presentations from the conference breakout sessions, please scroll down and click on the titles of different talks. View the conference events page to learn more about past and upcoming conferences. The first CERTs Conference, Tommorow’s Energy in Communities Today, was held in St. Cloud in February 2005.